2017 WIAA qualifying Kaukauna High School golf team. KHS photo. 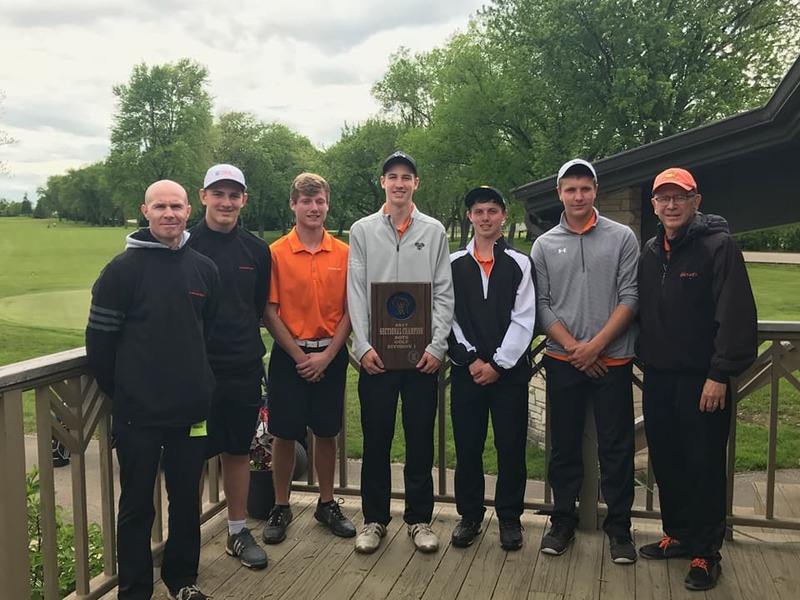 KAUKAUNA — The Galloping Ghosts tee off Monday in the WIAA Division 1 state golf tournament that takes place June 5-6, 2017 at University Ridge Golf Course in Madison. THE MEET: The 92nd Annual Wisconsin Interscholastic Athletic Association Boys Golf Championships will be held Monday and Tuesday, June 5-6, at the University Ridge Golf Course in Madison, Wis. Competition will begin at 7 a.m. on both days. Practice rounds Sunday begin at 7 a.m. Tee time assignments for Sunday practice and for Monday’s play are posted on the boys golf page of the WIAA website. THE FORMAT: The competition features 16 teams and 24 individual qualifiers in Division 1, and eight teams and 12 individuals in Divisions 2 and 3. Weather permitting, all competitors will play 36 holes, including 18 holes on each day. The lowest scores from the first day will have the later tee times Tuesday. THE FIELD: In Division 1, the field consists of the top two teams from each of the eight sectionals. In Divisions 2 and 3, the top two teams from each of the four sectionals qualify. The top three individuals, who are not members of a qualifying team in each sectional, also qualify for the meet. LAST YEAR: Marquette was the Division 1 State champion by shooting a four-player, 36-hole score of 598, which was eight strokes better than runner-up Middleton’s 606. Emmet Herb of Middleton was the championship’s medalist with a 36-hole score of 138. Catholic Memorial won the Division 2 title with a four-player, 36-hole score of 621. Edgewood placed second with a score of 633. Matt Bachmann of Sheboygan Falls earned medalist honors by shooting a 147. St. Mary’s Springs won the Division 3 title with a score of 629, a comfortable 27 shots better than runner-up Cochrane-Fountain City with 656. Tyler Leach of Spring Valley shot a 146 to win medalist honors. CHAMPIONSHIP NOTES: Madison West holds the record for the most team golf titles with 15. Osseo-Fairchild is next in line with nine, followed by Arrowhead and Racine Park with seven. Madison West has also produced the most individual champions with nine. Arrowhead is the only school to have won four straight team titles (2007-10), and there are four other schools that have won three straight championships. Osseo-Fairchild did it in 1994-96; Racine did it in 1923-25; Madison West accomplished the feat in 1934-36 and 1960-62; and Middleton did it from 1997-99. Bill Heim of Green Bay Preble and Jeremy Lyons of Glenwood City are the only individuals to win medalist honors three times. Heim won from 1986-88 and Lyons from 1997-99. TEAMS COMPETING: The schools qualifying for the State meet in Division 1 are Kaukauna, Arrowhead, Badger, Bay Port, Brookfield Central, Eau Claire Memorial, Madison Memorial, Marquette, Monona Grove, Mukwonago, Muskego, Plymouth, River Falls, Sheboygan North, Waunakee and Westosha Central. Teams qualifying in Division 2 are Brookfield Academy, Edgewood, Kewaskum, Lakeland, Lodi, Rice Lake, Winneconne and Xavier. Qualifying teams in Division 3 are Abundant Life Christian/Madison Country Day, Cochrane-Fountain City, Coleman, Eleva-Strum, Howards Grove, Luck/Frederic, Pacelli and St. Mary’s Springs. DIVISION 1 INDIVIDUAL QUALIFIERS: The other individual qualifiers in Division 1 are senior Jake Smith of Beaver Dam; senior Justin Meseberg of Burlington, senior Peter Dorward of Cedarburg, senior Bryce Lindsley of De Pere, junior Brett Grulkowski and sophomore Nolan Ruffing of Franklin, senior Ryan Dessart of Green Bay Preble, senior Robbie Morway of Homestead, junior Kade Salemi of Janesville Craig, senior Derek Michalski of Marshfield, junior Steven Sanicki of Menomonee Falls, junior Andy Zucker of Middleton, juniors Jack Halama and Sam Warpinski of Notre Dame, junior Zach Shawhan of Racine Case, junior Dylan Brown of Reedsburg, senior Carter Simon of Sun Prairie, senior Eric Chambers and sophomore Connor Brown of Union Grove, junior Garhett Kaegi of Verona, senior Matt Tuman of Wausau East, junior Josh Yang of Wausau West, junior Adam Garski of Wauwatosa East/West and senior Max Rohlinger of West Bend West. DIVISION 2 INDIVIDUAL QUALIFIERS: The individual qualifiers in Division 2 are junior Robert Johannes of Amherst, sophomore Scott Gregor of Ashland, senior Alex Brandt of Chilton, junior Isaac Heckmann and sophomore Lukas Heckmann of Lakeside Lutheran, senior Dakota Langlois of Marinette, senior Caleb Martin of Mayville, senior Spenser Scholl of Medford, senior Hunter Pipik of New Berlin West, junior Bryce Jacobson of Peshtigo, senior Andrew Cook of Tomahawk and junior Brandon Staudt of University School. DIVISION 3 INDIVIDUAL QUALIFIERS: The Division 3 individual qualifiers are senior Matthew Amorose of Argyle/Pecatonica, senior Payton Freagon of Cadott, senior Noah Cortez of Kenosha Christian Life, senior Josh Hentrich of Lancaster, senior Quinn Schultz of Luther, junior Ryan Schuelke of Manawa, junior Austin Schnell of Mishicot, junior Garrett Gifford of Mondovi, freshman Drake Wilcox of Sheboygan Lutheran, junior Tyler Leach of Spring Valley, senior Maggie Warner of Wabeno/Laona and senior Grant Germano of Williams Bay. FOLLOW THE TOURNEY ON TWITTER: Receive the updates of the Boys State Golf Tournament on the WIAA State Tournament Twitter account @wiaawistate with the hashtag #wiaagolf. Also like us on Facebook, follow us on Instagram at wiaawi, and add us on Snapchat at wiaawis.